A woman who died in a crash involving a bus and two cars on the Isle of Wight was a "much loved" mother and grandmother, her family has said. Yvonne Copland, 64, from Shide, died following the collision near Newport at about 12:45 BST on Sunday. A family tribute said she was "loved by all who knew her". Bus operator Southern Vectis said it believed its vehicle ended up in the path of a car after a crash at a cross-road moments earlier. Twenty-two people were injured in the crash on Forest Road, with four in a critical condition, police said. Mrs Copland was travelling in a Fiat Bravo along with three other people. 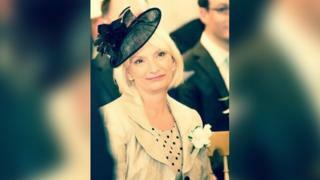 In a statement issued through Hampshire police, Mrs Copland's family said she was a "much loved wife, 'ma' of four children and four grandchildren who was loved by all who knew her. " "We would like to thank the efforts of the first responders, air ambulance crew, paramedics, police, fire, members of the public and all hospital staff," it added. Southern Vectis said it believed the crash was caused by a car pulling out in front of its double-decker bus. General manager Richard Tyldsley said: "Early indications suggest a car pulled out in front of a route seven bus and our driver was unable to avoid it. "The bus was forced into the path of another car." In a statement, Hampshire Constabulary said: "The cause of the collision is under investigation and we would not be able to give any further details." Four air ambulances attended and airlifted four casualties to hospitals in Brighton and Southampton. Four people who were in a silver Mini Cooper were taken to hospital as a precaution. St Mary's Hospital in Newport declared a major incident as it treated 15 patients. The bus driver, a man in 50s, was seriously injured and 10 bus passengers were taken to hospital as a precaution. The A3054 Forest Road was closed for about 11 hours near the crash scene at the Whitehouse Road junction. Since the crash, more than 2,000 people have signed an online petition to install traffic lights at the "blind spot". One signatory wrote: "I am a driving instructor and hate bringing my pupils here as it scares me." Another said: "It has been known that it is lethal for years." Isle of Wight Council said: "Any decision by the council to implement road safety measures... would be only done following... a thorough investigation of the circumstances of what happened."